BAND-IT ID Tags & Systems are a range of cable tags manufactured from corrosion resistant stainless steel in grade 304 and 316. The tags have no sharp edges and will therefore not cause damage to cables, pipes or hoses and they are attached using BAND-IT Tie-Lok Ties. The BAND-IT ID Tag Imprinter Tool enables the installer to print their own tags – available with different character sizes and with the character wheel, weighs 29.5lbs 0.22kgs. 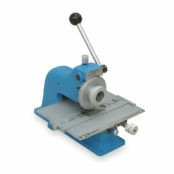 A fixture which allows imprinting on stainless steel banding and bands up to 3/4″ x 0.030″. Order code – BAND-IT ID285. ➡ Thorne & Derrick stock and distribute the complete range of Cable Tags manufactured by Band-It from stainless steel used to identify LV MV HV cables, pipes and hoses.